Judy has performed over 1,500 concerts in the United States with husband Mark Levesque. They have developed world class arrangements that blend classical, Brazilian, Latin American, klezmer, gypsy, jazz, Celtic and folk music influences to create a unique and extraordinary sound. This, matched with their impeccable musicianship, has won them a widespread enthusiastic following. Handler & Levesque have performed for festivals, arts centers, universities and museums, some of which include Troy Music Hall, International Festival of Arts & Ideas, The Brooklyn Museum of Art, The Hudson River Museum, Roger Williams University, The University of Connecticut, The Bushnell Performing Arts Center, The Hartford Symphony Orchestra’s Musical Dialogue Series, The Byron Colby Barn, Music Mountain and the Jewish Museum in Manhattan. They have performed for many community events including First Night Westport, The Mystic Arts Café, Bean Blossom Music Series in Indiana, the Rainbow’s End Series in Chicago, Nashua Public Library in New Hampshire and the Quechee Club in Vermont. Since 2008 Judy has been performing with flutist Barbara Hopkins as The Rosewood Chamber Ensemble. They have developed four programs based on music from 19th century America with background stories about the periods, historical figures, music and instruments. Judy performs on a Martin parlor guitar which is the same model that Mark Twain owned and played. Barbara has several Asa Hopkins flutes made in Connecticut in the 1830s as well as Classical & Romantic era flutes. Judy has given concerts & workshops throughout the United States. Her solo playing spans diverse genres of music including classical, Latin American, Brazilian, and jazz arrangements. She has performed with many prominent guitarists including Charlie Byrd and Oscar Ghiglia. Judy has received numerous awards including an Individual Artist Fellowship from the Greater Hartford Arts Council. Judy's studies began in her hometown, Chicago and she went on to earn a Bachelor of Music in guitar from the College Conservatory of Music at the University of Cincinnati, a Master of Music from the Hartt School of Music, and certificates from summer studies at the Aspen Music Festival, the Vila-Seca i Salou Conservatory in Spain and a Diploma of Merit from the Accademia Musicale Chigiana in Italy. She enjoys teaching guitar and runs monthly performance classes at a private studio in Vernon, Connecticut. 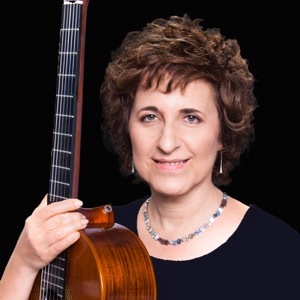 Judy is co-founder of the Connecticut Classical Guitar Society, one of the largest organizations of its kind in the country.